correct manner, the scale can give you great information about your body composition. Below are a few tips to make the most of your scale and use to help you evaluate your progress beyond just how much you weigh. Calibrate your scale: You can pick up a spring scale for under $20 at any big box discount store, but the old saying, "You get what you pay for" really holds true with the cheaper scales. Spring scales provide the least accurate reading. If you are using a spring scale (the kind you step on and the needle moves around a dial to reveal your weight), make sure it's calibrated correctly. To do this, have your doctor weigh you or weight yourself on a balance scale at the gym (the type you stand on and move the weight balance to reveal your weight). Once you have your accurate weight, stand on your spring scale and see if there is any difference. Usually, you'll weight less on the spring scale. So, if you're 4lbs lighter on the spring scale, then move the needle on the scale from "0" to "4." This will give you a more accurate reading. Same time, same place: Keep your scale in the same location, don't move it around. Particularly with spring scales, the more it's moved around, the more likely the calibration will get off. So avoid storing it in a cabinet and taking it out each time you weigh. Also, weigh yourself at the same time each day. Within the same day, your weight can vary +/– several pounds. A morning weight and an afternoon weight can be very different. Expect variance: Having your weight vary +/– 2-4 lbs from weigh-in to weigh-in is normal. As long as your weight stays within that +/– range, you're fine. If the trend is that it keeps getting higher, that's a different story. Hydration, the types of food you've eaten, the amount of food you've eaten, bowel movements (or the lack there of) can all affect your weight and it has nothing to do with decreased or increased body fat. Just normal fluctuations of your body. Exercise can cause muscles to retain water and eating carbohydrates can cause your body to retain water. You should not avoid either, it's natural. That water retention is temporary and not body-fat weight gain. If you've ever carb-loaded before a marathon, you may have had that bloated feeling and the scale may say you've gained a pound or two. That's actually a good thing. That means your body is retaining some water meaning you'll be well hydrated on race day. During the race, that water will come in handy and you'll lose that extra water weight. it really doesn't give you the big picture. All it provides is your weight. Owning or having access to an electrostatic impedance scale will provide you with a wealth of data that will give you more information about your body composition. This type of scale looks similar to a spring scale, but there is no dial. It has a digital display. You stand on this type of scale barefoot (it needs skin contact for an accurate reading). While standing, the scale sends an electrical impulse up through your body. Don't worry, you feel nothing and it's safe. The rate at which this impulse travels determines everything from your weight, body fat %, lean mass, water %, visceral fat, BMR, MET age, bone mass and more. 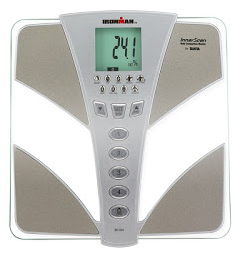 Many fitness studios and gyms have such scales, if you're not ready to purchase your own. Depending on what you buy, you can expect to pay about $60 to several hundred dollars for such a scale. In the studio, I use the Ironman by Tanita and it runs about $150. Take some data: Now I don't mean keep an obsessive log of each weigh-in, but it's a good idea to periodically record your stats. This gives you a benchmark from which to compare progress. Know your numbers: Have you been working on your nutrition with a weight loss goal and working out? Have you be perplexed feeling like you've lost weight but the scale is telling you something different? Clothes feel lose. You feel better than you ever have before. You're eating smart. But that dang scale keeps saying you've either lost nothing or gained! 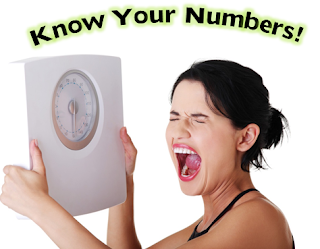 Well, if you know your numbers, then that weight gain may be a good thing. WHAT? Crazy talk, right? Nope...a good thing. For example, last year about this time, I decided to drop about 25lbs. I was getting ready to turn 50 and I wanted to head off that middle-age weight gain. So, I began to make sure I was getting in "Me" workouts and "Me" runs. While I didn't go on a diet, I did start to be more cognizant of what I was eating and making smarter decisions about what I was eating. As a result I lost that 25lbs. But.....in the past 2 months, the scale has shown a weight gain. Now this would cause a panic in most individuals. Weight gain must mean body fat gain. Right? Not always. Fortunatly I knew my nubmers. In the past two months, I've been upping my resistance training. I looked back my the data I had recorded from my weigh-ins and I saw that my body fat had not increased. It was still at the lower end of the healthy range. What had changed was my lean mass....my muscle mass. I had gained some muscle! Six pounds of muscle in fact! Awesome! This muscle gain actually makes me look even leaner. It also, means I'm stronger and have more muscular endurance which is supporting me on my runs, particularly my long runs. Men and Women are not created equal...when it comes to body fat: Healthy body fat % numbers for mean an women are apples and oranges, so know your numbers. I can't tell you how many ladies have heard me say their body fat is 25% and they're devastated, when that's an awesome body fat perfect for ladies. Actually the low end of the healthy range for an 18-year old female is 21%. As you know, men and women are physically very different. Women need more body fat. The low end of the healthy range for an 18-year old male is 8%. Men do not need as much body fat. But remember that the young lady at 21% body fat isn't fat because she has 13% more body fat than her male counterpart. It means she's lean and has exactly what she needs for her body to function properly. Below are the healthy body fat ranges for men and women. Not all body fat % measures are equal: The most accurate way to determine percent of body fat is to do a water displacement test...the "Tank Test." This is the test where you're submerged under water. While this is the most accurate, it's not the most convenient and it can be expensive. There are several other methods used to determine body fat percent such as the electrostatic impedance scale I mentioned above, an air displacement test, and a caliper pinch test. All of the non water-displacement tests have a +/– error rate of 4%. I've had two different clients (one female, one male, one physically fit and one not as fit) have the tank test done. The next day they came to the studio and we checked their body fat using the electrostatic impedance scale. The body fat of both individuals was 4% higher on the electrostatic impedance scale as compared to the tank test. So when using the scale with my clients, I give them a range. If the scale says their body fat is 25%, then I tell them their body fat could be as low as 21% and as high at 25%, both of which are healthy. Determining body % percent at home is not an exact science. The main thing to keep in mind is that if you're not wanting to loose/gain weight, you want the number you see to remain constant. If you're trying to lose weight, you want to see that number get smaller over time. Don't become discouraged. In today's rush, rush, quick-fix society, we often want immediate results. If you have extra weight you want to lose, it's going to take time. Losing weight slowly over a longer period of time has a much higher "keep-it-off" success rate than dropping a lot of weight in a short period of time. If you're combining exercise along with weight loss, you may not see much change on the scale initially, even though your clothes may feel looser. Just like I described above, you may be increasing your muscle mass while at the same time decreasing your body fat %. So on the scale it may be a wash. This often happens the first month or so. Stick with it and your weight loss will start to show on the scale. Taking girth or circumference measurements of your hips, waist, thighs, calves, biceps, chest, etc, is also a great idea. After a couple of months of your new diet and exercise regimine, retake your girth measurements and even though the scale may not reflect a huge weight loss, you may discover you've lost an inch in your waist, a half-inch in your calf, a couple inches in your thigh. More proof that your body composition shifting in the right direction.